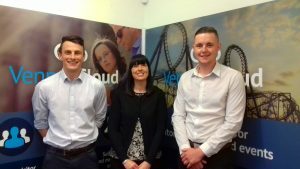 Aldridge’s ticketing software company Vennersys is targeting business growth with the appointment of three new members of its sales team. The company has undergone a 53% expansion in its team in the last two years, with entry into new markets including Scottish attractions and the heritage railway sector. Luke Fletcher joins Vennersys as a business development executive, Joseph Paul, as a client account manager and Sharon Horton as a telesales executive, as the Aldridge company looks to expand its client base. Business Development Manager at ticketing software company Vennersys, Martin Fallows, commented: “We’re delighted that Sharon, Joseph and Luke have joined Vennersys as we’re going through a period of sustained growth and change as a business – this is primarily down to our cloud-based product – which is going from strength to strength. Joseph will be supporting existing clients to ensure they are happy with the level of service Vennersys provides and utilising all the functionality the software has to offer. Sharon has years of customer service experience having previously worked at the Jardine Motors Group where she worked in after sales. Her role is to contact all of existing customers and update their details in line with the recent GDPR regulations. Vennersys offers a dedicated and secure ticketing system for visitor attractions, with Venpos Online enabling attractions to sell tickets, merchandise and experiences on the web, 24/7. Markets served by Vennersys include historic houses and estates, museums and galleries, cultural and heritage sites, safari parks and aquariums, zoos and botanical gardens, farm attractions, children’s play and activity centres, heritage railways and family entertainment centres.